Fun Spot America Expansions : Theme Park News & Construction! Fun Spot America (Fun Spot Action Park) in Orlando Florida has announced that they will be tripling in size from five acres to fifteen acres. The Fun Spot located at Grand National Drive and Del Verde Way will be expanding into vacant land to the north of the park. 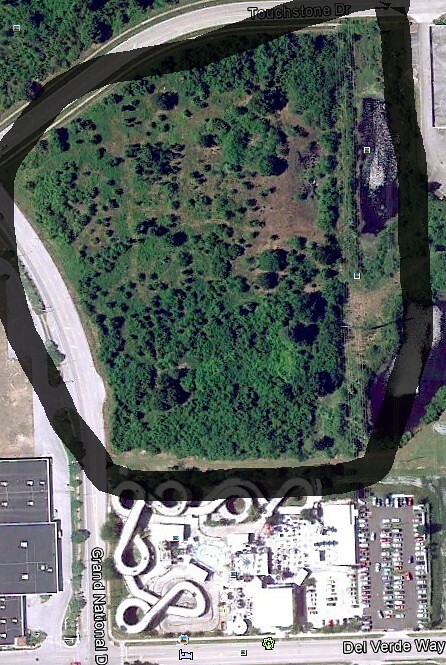 Land inside circle is where they are expanding. The Fun Spot is now going to be building a waterpark and two roller coasters in this area. One of the roller coasters will be a family type ride and the other will be a GCI L-shaped rollercoaster that will go along the roads along the expansion area. All rides but the two level go-kart track will stay open. 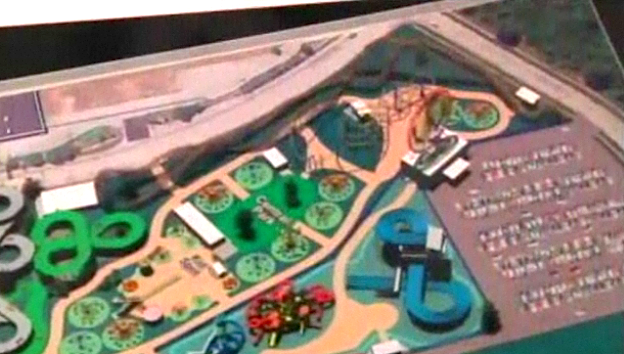 That go-kart track will be changed into a five level track. The expansion will be ready in 2013. Fun Spot will also be expanding into a test of the season/annual pass program. Both Fun Spots will be included in the pass and there will only be about 1000 to be purchased since the parks are testing the idea. The passes will cost $100 and are good from Christmas of 2011 to New Years Day 2013. And no, its not a Big Fun layout. and the other will be a GCI L-shaped rollercoaster that will go along the roads along the expansion area. Jonny what is that supposed to show? Try to use your brain before you respond please god. The big fun layout is not "L-shaped". I'm getting a little annoyed by the unlogical criticism from you and Coasterkid lateley. I completely and totally thought the capitalization of the letters was just a typo, not that it declared an actual design. I thought he was claiming it wouldn't be big or fun, dig? My huge apologies. And I'm not criticizing you, I'm bashing you, and I don't care if you're annoyed. Coasterkidmwm is not partnered with me, don't pair us. He can do what he wants. You are just unbearable. ALSO referring to the funnel water-slides that empty into the same funnel... will this be a dueling thing or will they send sliders down at different times? Oh, I apologize then. Just try not to be so quick to make me sound like an idiot. Five level go-kart track? That sounds amazingly fun. Says a worker from GCI and one from the Fun Spot on the latest episode of the CoasterCrew's InTheLoop podcast. Jakizle... I thought you lived in Texas... You now permanently live in Florida? Wow... Theme park meet-ups in the future? I'm home for a month starting the 21st. This seems to become the layout from the ride. Looks interesting, a GCI out 'n back coaster. Do you have that pic in more detail? Nope, sorry. This is all I found. We could always keep fingers crossed until somewhere a more detailed picture will be released. I completely and totally thought the capitalization of the letters was just a typo, not that it declared an actual design. Is that a 90∩┐╜ bank I see? Edit: Yeah and this doesn't show a 90 degree bank. I love how such a big, coaster building company hand builds in NL. And then pumps the track all over the place. Mine Blower - GG Wooden for Fun Spot America 2017 POV!